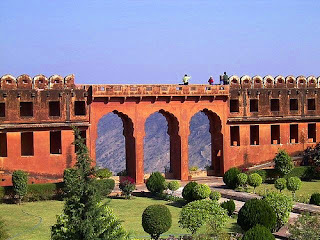 Whenever Man Singh I (late 16th century) or his successors warred and won gold, silver, jewels and other booty, they hoarded it in the Jaigarh Fort. and they had the loyal Minas to fiercely guard their haul. 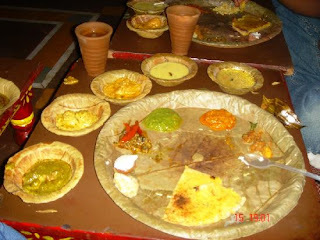 (In fact, legends tell us that the Minas were such strict guards that they let each new Kachhawaha king to enter only once and pick one single piece for himself from the dazzling pile!) Anyway, all this treasure paid first for building Amber, then Jaipur and for centuries of lavish living. Indian Government officials tried to retrieve whatever was left; they dug the place in 1976 but found nothing. In fact they even drained the three arched water tanks (in a courtyard on the way to the northern end of the fort) in the hope of finding the fortune there. Some say that everything was used up in building Jaipur while others claim that it is still there somewhere. The dictum of the ancient Hindu scriptures, the Puranas, 'a fort is the strength of a king', must have loomed large in the minds of the Rajputs while building the Jaigarh Fort. The ambitious Jai Singh II then expanded, remodelled and renamed it in 1726. and since this fort never fell in the hands of enemies, it stands almost intact to this day. 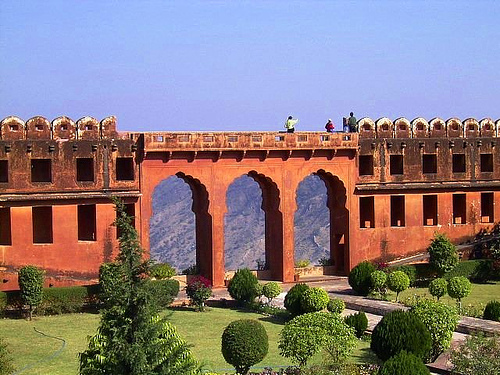 Jaigarh or the 'Fort of Victory' is perched on Chilh ka Tola (Hill of Eagles), 400 feet above the Amber Fort. The walls of the fort are spread over three kilometers. 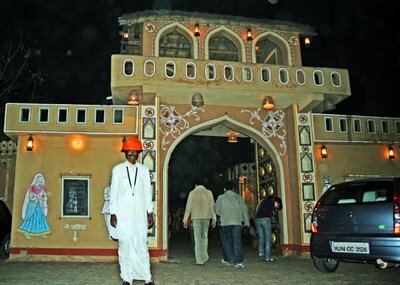 Once you enter through the massive south facing Doongar Darwaza, you'll instantly get a tangible feel of Rajput romanticism. and if you're lucky, Thakur Pratap Singh, a handsome Rajput with a fine moustache will be around to tell you stories of Jaigarh's illustrious past. The other entrance to the fort is through the Awani Darwaza in the east. 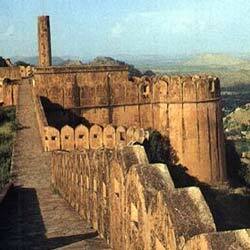 Jaigarh Fort is a remarkable feat of military architecture. After you enter, head straight for the gigantic cannon Jaivan perched on top of a tower. Weighing 50 tons with an 8m barrel and a trajectory of about 20km, it is said to be the world's largest cannon on wheels. Such was its might that it took four elephants to swivel it around on its axis. But surprisingly (and thankfully!) it was never used. Despite its awesome firepower, it has a delicate scrollwork of birds, foliage and a roaring elephant at its mouth. Jaivan was test-fired once by Jai Singh in 1720 when the cannon ball landed at Chaksu about 38km away! and the impact of it was so enormous that a lake formed at the spot and many houses collapsed in Jaipur. The cannoneer died immediately after the firing, before he could even jump into water. (It is mandatory for the cannoneer to jump into water to avoid the massive impact, and so there's always a water tank beside the cannon.) No wonder enemies didn't ever set their eyes on Jaigarh. There's even a notice here which proudly says, "because of the strong defence system, management and the foresightedness of the rulers, the enemy never dared to enter the fort." Walk through a great arch into the courtyard, Jaleb Chowk. But the most important part of the fort is perhaps Vijay Garh, the fort's armoury. Apart from the huge collection of swords and small arms including time bombs, there's an interesting treasury lock with five keys and big wine and oil jars. The 1681 map of Amber kept here is worth a look. If the show of so much armoury awakens the fighter in you, try your hands at the mini cannon which makes a pretty big bang. The Jaigarh cannon foundry, built by Bhagwan Das in the 16th century, is one of the few surviving medieval foundries in the world. It has a furnace, lathe, tools and a collection of cannons. It was Bhagwan's adopted son, Man Singh I, who brought the secret of gunpowder from Kabul in 1584 where the latter was the commander-in-chief of Akbar's army. Soon cannons began to be made in Jaigarh, much to the displeasure of the Mughals who kept the secret to themselves ever since they used it to fight the Lodis and Rajputs in 1526 (check History of Delhi for more). There's a point called Damdama (meaning 'continuous firing'), where there used to be a battery of ten cannons positioned to check any approaching army. This faces the Delhi Road. This led some to believe that Man Singh was secretly preparing for a showdown with his Mughal allies. 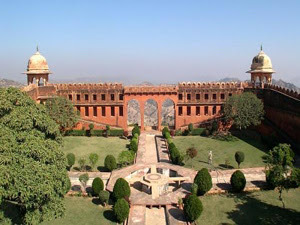 The museum of artefacts tells the story of the Jaigarh Fort and its vast well-protected treasury. There is an interesting collection of paintings, photographs and coins, and other things like a balance for measuring explosives and several containers including a 16th century coin container. 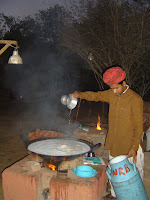 Don't miss the royal kitchen and dining hall; after all food and hospitality were also very much a part of Rajput agenda. The palace complex, built by various kings over a period of two centuries, has the usual structure beginning with the Diwan-i-Aam (Hall of Public Audience). 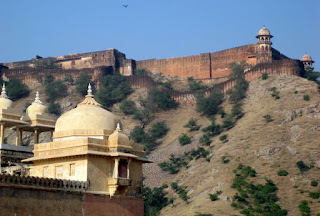 But it goes a step ahead of the Amber Fort in terms of defense; it has a Khilbat Niwas (Commanders' Meeting Hall) in place of the Diwan-i-Khas (Hall of Private Audience). There's also the open pillared hall, Subhat Niwas. But these are insignificant structures as compare to the ones in Amber Fort. This part of the fort is full of secret back passages for royal escape in times of emergency. The luxury suites are very much there – the breezy Aram Mandir (Rest House) and the 16th century Vilas Mandir (Pleasure House). The former has a lovely garden attached to it. It was in the charming courtyard of the latter that the royal ladies had their little parties, janani majlis. The pavilions surrounding the courtyard, with a maze of passages, offer excellent views of Amber. The Lakshmi Vilas Palace is a beautiful experience, with some lovely frescoes in blue and the remains of an old Mughal garden. It also has a little 'theater' hall where the rajas had their share of entertainment – dance, music recitals and puppet shows. 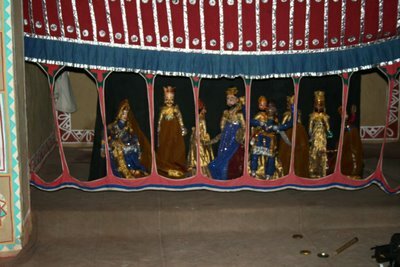 Do stop by at this Puppet Theatre which has been revived by some locals who hold charming shows. 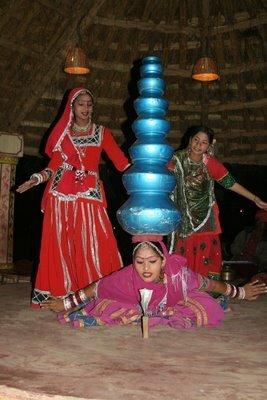 This old tradition of puppetry continues to be a popular folk entertainment in Rajasthan today, and tourists take a huge delight in watching such shows. There's a lot to see and do in this handicraft centre on Jagat Shiromani Temple Road. You can see demonstrations of the famous Rajasthan block printing, textiles which so many people, especially foreign tourists, are crazy about. Craftspersons churn up some exotic designs with wooden blocks and natural colours. The other centres of block printing in Rajasthan are Barmer, Sanganer, Bagru and others. See Arts & Crafts of Rajasthan for more on block printing. Shops at the complex also sell gems, jewellery, textiles, antiques and other handicrafts. By antiques one means artefacts upto 90 years old. 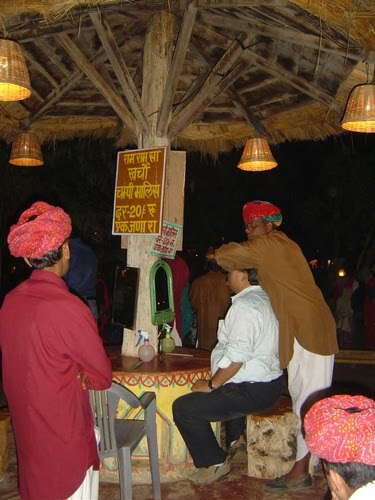 So take home a piece of Rajasthan, though the prices may be slightly high. 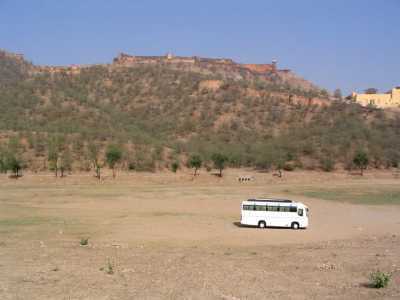 For an excursion to Amber, take a bus from the Hawa Mahal in Jaipur. There's one leaving every half an hour (Rs 3). Auto-rickshaws charge Rs 50. There are buses from the Jaipur Railway Station too.